Andy Grammer: Pretend you’re in peanut butter – Live! Starring ... You! LSY! 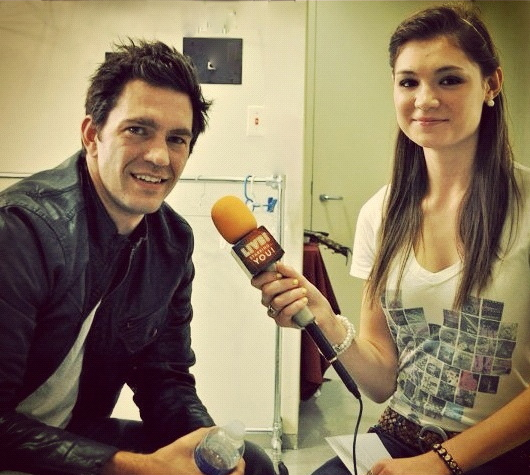 teen reporter Jessica Wojcinski interviews singer-songwriter Andy Grammer. For this week’s Memories Monday installment, we dip into the LSY! archives and polish off a story and interview by Jessica Wojcinski, who was then a senior in our program at Mount St. Mary Academy and is now a performer and music major at Nazareth College. This piece is particularly special to me because the subject, singer-songwriter Andy Grammer, inspired Jessica so profoundly that evening. I walked away forever an Andy Grammer fan simply because he was so incredible to Jess, as you’ll see in this story and the interview video at the bottom of the page. That was the advice Andy Grammer’s acting teacher gave him in college, one of many personal philosophies that helped him disregard the opinions of others to pursue his dream as a musician. That, and don’t get jaded. After my initial on-camera interview with recording artist Andy Grammer, I decided to go out on a limb. While I didn’t want to come across as unprofessional in front of him, his manager, and Tim O’Shei (my teacher and the founder of LSY! ), I figured I’d probably never talk to him again and now was my only chance to seek advice from someone that was living the life I eventually want to create for myself. I told him that I would like to go to school for music but don’t know where to start, and asked if he had any advice he could offer. He was more than willing, and at that moment I felt like we connected as fellow musicians. He completely opened up and gave some of the best advice I have ever heard about the music industry. He explained that he went to SUNY Binghamton for Music Business, then later studied in Los Angeles, California. Before he started playing on the streets of Santa Monica, he took an acting class in L.A., and I asked if he thought that helped his stage presence. He explained that when you write a song after a serious breakup or whatever emotional experience you’ve gone through, it becomes a part of you. But just because it has truth behind it doesn’t make it a great song. The words, the music, or anything could be slightly off to make it less than perfect. He said that the best advice he could give me was to not get jaded. He smiled and got up to say goodbye to us. I wanted to hug him and thank him profusely, but gestured to shake hands instead. I knew I wouldn’t be able to explain how he had inspired me without crying, and I didn’t want him to think my overflow of gratitude really came from infatuation. He surprised me with a hug and Ahmed showed us out of his dressing room. On the way out, we passed Colbie Caillat’s dressing room. Originally, I was supposed to interview her and had been disappointed to discover that I’d be interviewing Andy Grammer instead. I laughed to myself and thought how incredibly blessed I was that things hadn’t gone my way, and maybe even how differently my life would be if I had interviewed her instead. During Andy’s set, I watched from just feet away, taking pictures from the aisle. Afterwards, I waited in line to buy a t-shirt and bracelet, and figured I might as well talk to him one last time. When I got to the front of the line, I smiled and said, “Remember me?” and Ahmed and Andy both laughed and said, “Of course!” I handed Andy my t-shirt and while he signed it, I told him that I actually just got in line to tell him that some of the things he had said after the interview had really hit home for me, and thanked him again for taking the time to meet with us. Embarrassingly enough, he must’ve either heard something in my tone or seen that I was tearing up again because he said, “Aw!” and hugged me again before we posed for the picture. As I was walking away, I saw that he had written on my t-shirt, “Keep pushin’!” with a smiley face and his signature. Especially in today’s world, it’s rare to come by such a humble and talented performer. He was discovered when he was playing on the street simply because he loved to sing. Andy is an example to not just musicians, but people everywhere, that if you stay true to yourself and don’t get jaded, your dreams really can come true.